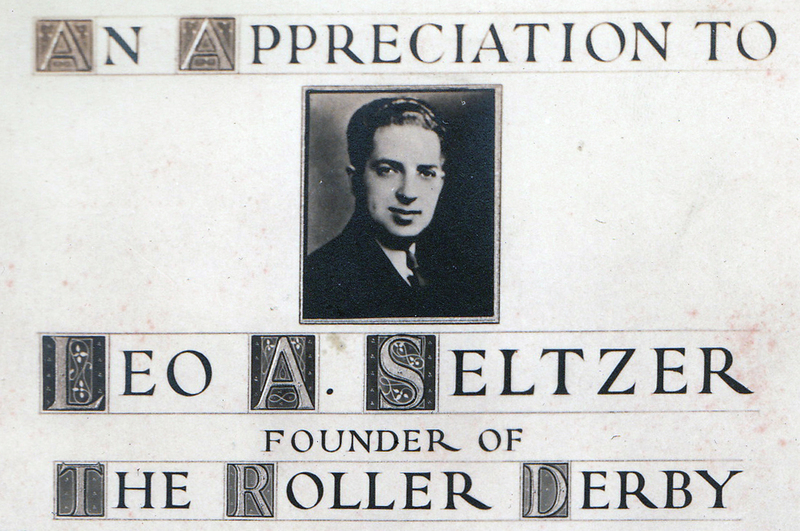 An Appreciation to Leo A. Seltzer. January 30th was the 33rd anniversary of Leo Seltzer’s death. Roller Derby had officially ended in December 1973 when the last track was set up. But in his mind, it had ended before. He was so anxious to see it go to full legitimacy that it haunted him. And the fact that roller games was such a parody of what he created troubled him to the very end. He was a successful developer of real estate in Lancaster, California, lived part time in Gearhart, Oregon where he fished, gardened and never stopped trying to bring back the game he loved. He was planning to spend the summer of 1978 in Montreal where he felt the best skaters he had seen of the “new” generation, because of the background in hockey and other sports. But a severe headache sent him to the hospital. I got the call from Belle and immediately flew to be by his bedside. During the time I was travelling, he suffered an aneurism from which he never awakened. When I arrived at the hospital he was on a breathing machine. Because of a disagreement between us (I don’t even remember what over), we had not talked much in the last six months. I went by his bedside alone and told him how much I loved him and was sorry that I had disappointed him. Later the doctor came and talked to all the family and was pretty cold about it; my father’s brain had stopped functioning and the kindest thing to do was to let him pass away. We did the next morning. I don’t think any of you reading this can realize how much I think about him and how the most important thing in his life besides family had disappeared in his lifetime. And every time that I think or talk or look at Roller Derby today, I wish he could just have known what his game would become and how it would change people’s lives and bring joy and kinship to so many people around the world. So wish him a happy birthday on April 5. He will be 108. What a wonderful post. Every good father wishes to be loved and remembered fondly by his children. Your dad knows he was blessed to have you, as much as you were blessed to have him. You’re a dad – you know. Jerry, thanks for the memories! This post made me cry! My father had a stroke 6 years ago that also put him on life support before I could say goodbye. We were also told his brain was not functioning and had to make the deciscion to take him off life support the next day. He was 52 years old. I miss him every day and he has left a huge space in our family. I started to play Derby because I needed something just for me something to pick me up off the ground. I haven’t even been able to play in my first bout yet but Derby has done that and so much more for me. My dad always had faith in me so my Derby # 3two1 is for him. His birthday is March 21st. I know my dad is watching over me and is proud as I know your dad is too! Thanks for all of your support to each and everyone of us derby girls!! You are my Derby Dad now! Reading your lovely post about your dad and knowing that we have short time in Sonoma, i would like to say that you are our best reason to come back next year. Thank you for taking care of my family and especially the affection that you show for my kids. I, Claudia, Clara, Cata and Kim missing you already even before our left. Nei and Claudia head up the lovely family from Sao Paolo Brazil that own the house I stay in…..